7 Simple Tips For Getting Lean This Summer! Summer may be well underway, but there's still time to lean out for the beach! Make the most of your summer shred with these athlete-approved tips. Summer is the season of lean, but even if you didn't manage to sculpt your dream beach body last spring, you certainly don't have to hide under oversized T-shirts at the beach! 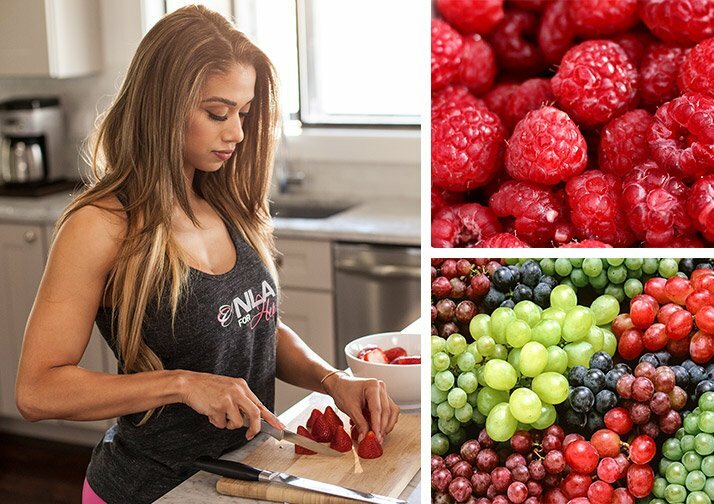 With these summer shred tips from fitness models and NLA sponsored athletes Jessie Hilgenberg and Lais DeLeon, two of the fittest women in the fitness industry, you can kick-start a summer transformation that will leave you feeling great and ready to soak in the sun's rays! For many people, the warm weather is an appetite killer, which leads to low calorie consumption during the day and a lot of bingeing at night. But lagging hunger doesn't mean your body doesn't need fuel. Instead of eating heavy meals, trick your stomach into beating the summer slump by changing up your mealtime schedule! Instead of eating heavy meals, trick your stomach into beating the summer slump by changing up your mealtime schedule! "Nothing will make you feel more sluggish during the hot summer months than eating a huge meal," says Jessie Hilgenberg. Her solution? Eating smaller meals more frequently. Hilgenberg suggests eating 5-7 small meals every 2-3 hours instead of three large meals per day. "When it's hot, you want to feel light and active," she says. "This timing and portioning will keep you fueled, but not overly full, throughout the day." When it comes to getting ready for the beach, Lais DeLeon turns to her secret weapon: fasted morning cardio. "While I personally hate cardio, the best way to ensure that you're burning calories and working toward your hard-earned summer body is to integrate it into your routine," says DeLeon. When she really wants to turn up the heat, DeLeon gets up 30-40 minutes earlier than normal and breaks a sweat before she starts her day. This strategy ensures that she gets her cardio done regardless of any fun summer distractions that may pop up throughout the day. It's not always easy, but it's the dedication needed to sculpt a stunning summer physique. No one wants to be cooped up inside a gym when the weather warms up, so consider taking your cardio outside. "Swimming is one of the best forms of cardio," Hilgenberg says. "It's friendly on your joints and keeps you cool!" No one wants to be cooped up inside a gym when the weather warms up, so consider taking your cardio outside. While you can build a great workout by swimming laps or intervals of 25-50 yards for a set amount of time—15 minutes is a good place to start—you don't necessarily have to. "You can swim laps, or just gather your friends and have a pool party with some games," Hilgenberg says. Not a huge fan of the pool? There are plenty of warm summer activities that torch calories quickly, so start thinking outside of the box. "You can hike, bike, kayak, and rock climb, to name just a few," says Hilgenberg. Doing new, fun activities will help you build muscle while keeping you engaged. Just don't forget the sun screen! Not only will the sun's hot rays leave you more dehydrated than normal, even slight amounts of dehydration can impair your athletic performance, slowing your fat-burning fitness efforts. The solution: Drink up. "I'm on the go a lot during the summer months," Hilgenberg explains. "I like to carry a large water bottle with me so I don't have to stop and refill very often." Your best bet? Grab a big jug and go! Hilgenberg recommends aiming for a gallon of water each day to meet your hydration needs. If you're exercising outside and sweating heavily, you may need even more than that. Remember to hydrate at the first sign of thirst, which is actually a warning that you're slightly dehydrated. To add a little extra burn on top of your clean diet and hard work, DeLeon recommends trying an all-natural fat burner. "While a fat burner is totally optional, I personally like to take advantage of any safe resources available to me when I really need to burn calories," she says. By using a fat burner like NLA for Her Shred Her, which contains well-researched thermogenic ingredients like green tea extract and caffeine, you can increase your body's overall fat-burning potential, allowing your hard work and constant effort to reap bigger benefits. Fat burners certainly won't do the work for you, but they can help you maximize your results. Natural Fat Burner! Formulated and Dosed for Females Designed to Promote Fat Loss! Go Now! DeLeon takes Shred Her first thing in the morning for about 2-3 weeks at a time when trying to lean out. "It helps me wake up for those extra-early-morning cardio sessions while also curbing my cravings," she adds. "One sure way to slow down your fat loss is to overdo the sugar," DeLeon says. Sugar spikes insulin production, which can lead to fat storage and blunt your body's ability to use fat for fuel. "One common mistake many people make is eating excessive amounts of fruit to replace their otherwise unhealthy snack options and sugar cravings," DeLeon adds. While fresh fruit is a healthier option than, say, chocolate chip cookies, many fruits still contain plenty of sugar. Consuming too many calories, even if they're from "healthy" sugars, can still lead to weight gain. DeLeon aims to limit her fruit intake to 1-2 servings per day, only eating them within two hours of a workout. DeLeon aims to limit her fruit intake to 1-2 servings per day, only eating them within two hours of a workout. This helps ensure those carbohydrates get used as fuel, or to replenish her instead of being shuttled away and stored as fat. Remember that not all fruits are created equal. There's only 5.4 grams of sugar in one cup of raspberries, but there's 23.4 grams of sugar in one cup of grapes. Your choice of fruit really makes a difference in your total sugar consumption for the day. Once you've reached your get-lean goal for the summer, don't completely ditch your diet. "Diet is more important than ever at this point," DeLeon says. "This is what you've been working so hard for, and the last thing you want to do is throw it all away by relaxing completely." DeLeon recommends setting a designated cheat day to help you stay on track. But she does have one caveat: All cheating should happen outside your home. "Only keep your 'lean for summer' diet-approved items in your house, or you're going to make cheating too easy," she says. Another trick to make healthy eating simple is to have a few ready-to-go healthy meals. Another trick to make healthy eating simple is to have a few ready-to-go healthy meals. DeLeon likes to keep veggies and lean protein—like grilled chicken breast or tuna—prepped for those hot summer days when no one feels like turning on the stove or oven. Bonus Tip Get a Tan! Once you've leaned out, a little color can help take things to the next level aesthetically. While Hilgenberg never recommends sun bathing, she does recommend alternative methods to getting that summer glow. "A spray tan or tinted moisturizer and lotion will tan white legs in a hurry," she laughs. "That will really make your newly defined leg muscles pop."